The Great Patriotic War left its mark on the lives of many ordinary people. The fact that soldiers and doctors have seen during the hostilities cannot be transmitted by any film, any film. Doctors and nurses could not lose courage. Many poets sang them, artists dedicated their canvases to them. Marat Samsonov showed a fragment of the hard life of a nurse. On his canvas “Sister”, which he wrote in 1953, he depicted a nurse, who pulls a wounded soldier from the battlefield. His eyes are bandaged, apparently he lost his sight. Fragile girl pulls on himself an adult man, his weapon. Despite the gravity of the situation, she believes that they will win. The image that Marat presented to us is the image of a hero, majestic and courageous. The landscape, which the artist depicted in the picture, only reinforces the whole drama of this episode. This style is inherent in all the paintings of the artist. Together with the young men bravely fought on the battlefield and the girls. The author managed to portray a woman in the image of a courageous girl who is forced to be a nurse. Marat Samsonov knows about the war from within. As soon as the war began, he joined the army as a volunteer. He studied at the military school in Kalinin, was a lieutenant. Participated in the parade dedicated to the great Victory, which took place on June 24, 1945. After the war, Samsonov began studying at the studio of military artists. M. B. Grekov. 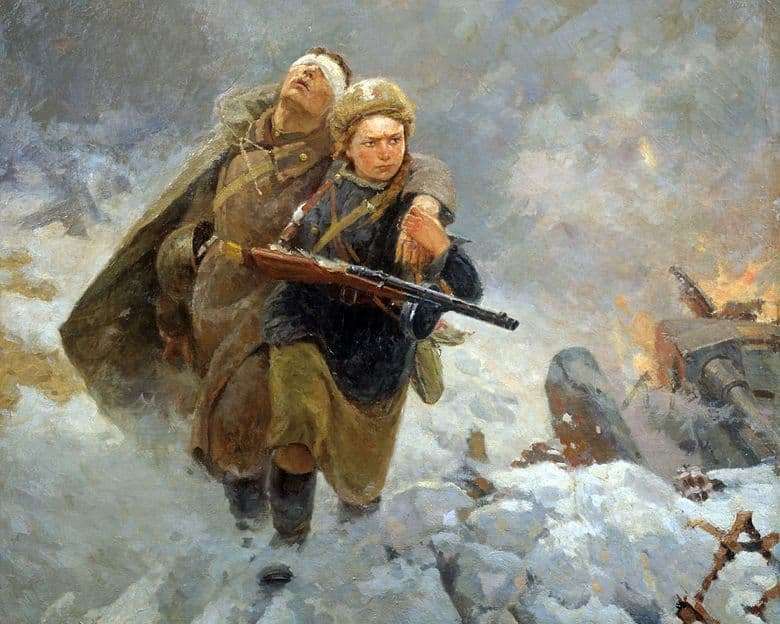 Today, the painting “Sister” is exhibited in the Central Museum of the Armed Forces.